The Xtender series is the latest generation of inverter/chargers from Studer. It provides extended functionality and extraordinary operation comfort. One of the new features is the Smart-Boost function (power shaving). Smart Boost enables to add inverter power to a connected AC power source, like e.g. a genset. This offers the possibility to use undersized gensets and to operate consumers with high peak loads at the same time. Smart boost also works with inductive and asymmetric loads. Also new with the Xtender series is the possibility of coupling several units together to one power source. This feature allows you to set up a 3-phase power system or to reinforce single phases. 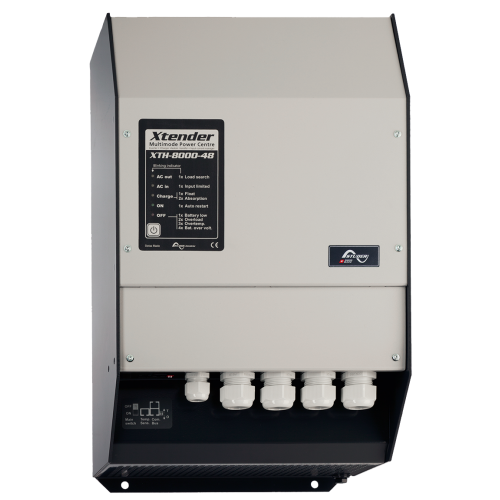 In total up to 9 inverters of the Xtender series with a maximum of 72kW continuous power can be combined together. Furthermore all Xtender inverters are equipped with two potential-free auxiliary contracts. They are fully programmable and can be triggered on various events inside or outside the inverter (e.g. availability of the external AC source, battery voltage, faults, ...). In combination with the built-in real-time clock the auxiliary contacts can also be triggered at a certain time (e.g. at night or at weekends). The most common application is to automatically start a genset, to switch off consumers with low priority, to indicate faults or to charge the battery depending on a certain situation. The optionally available remote control RCC-02/03 allows the user to survey the Xtender system and fully customize it to his needs. Thanks to its graphic display the RCC-02/03 provides clear and comprehensive indications of the system state. Furthermore the unit memorizes all events that occur during installation and operation, thus helping to solve problems and optimize the Xtender system.